Basically, there are four common skin types: oily, dry, combination, and normal. The way your skin reacts and behaves classifies the type of skin you have. Skin types react in different ways to creams and/or lotions, environment, and weather. 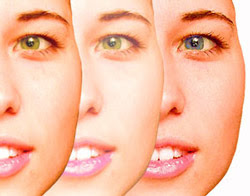 The skin on your face is the great point to categorize type of your skin. Skin may look oily, sallow, and coarse; it has large pores and tends to have pimples, blackheads and whiteheads. The texture of skin is thick; the touch is often sticky. It is usually youthful-looking due to the presence of oil on the skin. Besides that, within hours of cleansing the oiliness will reappear and makeup is usually absorbed quickly. Often, individuals with this skin type have a propensity to develop acne in their teen and middle years. This skin type has a transparent looking and fine texture. It may lack natural oils, may look rather flaky with small pores, blackheads and blemishes. It feels particularly dry after cleansing and may have whiteheads around the eyes and dry patches. Without sufficient moisture, this skin type can simply become chapped. It’s more likely to become wrinkly than other types. This type can be characterized as oily on the T-zone (forehead, nose and chin) and the rest of the face, cheeks and around the eye, is dry. However, to restore both areas to balance, they need a separate cleansing routine. If this is your skin type you are very lucky, because less than 20% of women have this skin type. It is the "healthy" type of skin. It’s smooth, soft, and supple; not too dry, not too oily, characterized by few blemishes, and has a nice glow. Nevertheless, this doesn’t mean that you don’t have to take care of it. 1. Cleanse your face, and wait for an hour, without applying any skin care product to it. 2. After that, take a tissue and wipe each of the following areas of your face: your forehead, nose, chin, and cheeks. If oil appears on the tissue, then you have oily skin. But, if skin particles can be seen on your skin, or remain on the tissue, then you have dry skin. Other than that, If you see oil in some areas (T-zone: forehead, nose and chin), and none in others, then naturally you have combination skin. And, if you don’t find oily residue or flake is left on the skin, you have normal skin. One thing that you should keep in mind, cleansing and moisturizing twice a day is an important thing of having attractive and healthy skin, regardless of what type of skin you have. For maximum results, select products that are intended for your particular skin type.